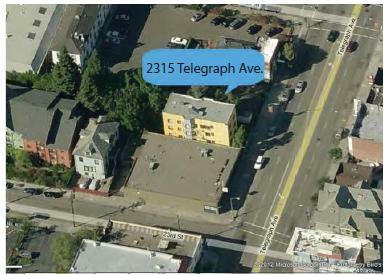 North Oakland Industrial compound, sprawling property in close proximity to MacArthur BART. 17 individual tenants all on month-to-month leases. Perfect for owner user or development. Industrial warehouse for sale in Oakland California. Located in the 880 corridor with 100′ of hwy frontage. Zoned HBX-2, 550 Sqft with roll up doors and interior parking. 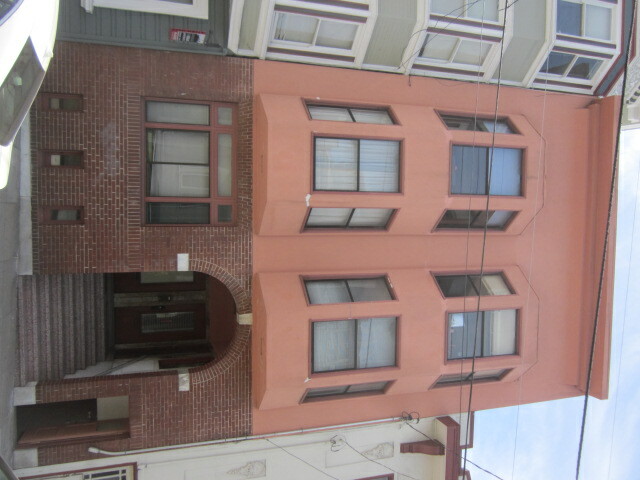 Listed at $1,785,000, tenant on month-to-month lease. Myerhoff & Associates exclusively presents this outstanding commercial corridor mixed-use property in the heart of South Berkeley Adeline business corridor. This elegant 1920’s style wood frame and stucco mixed-use 6-unit building is located in the burgeoning Adeline Business Corridor with favorable C-SA zoning allowing a wide variety of retail uses. Delivered entirely vacant. The property consists of two ground floor side-by-side commercial units approximately 1200/sqft each. 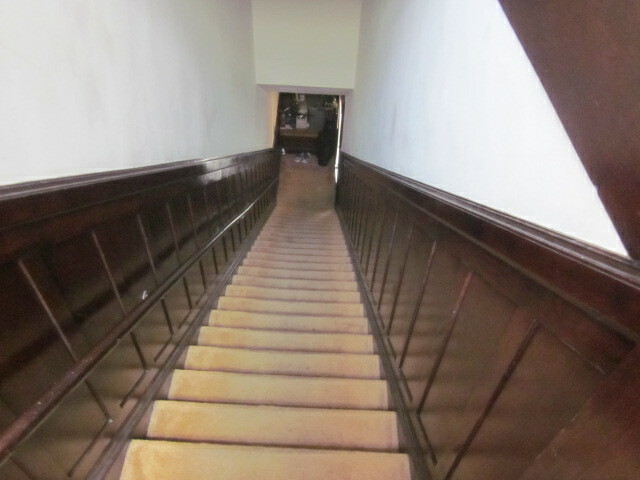 The upper two floors are residential units each with 3 bedrooms and 1.5 bath accessed via interior stairwell. There is a small shared backyard and rear decks off the two top floors. the country. Significant lack of housing and extremely restrictive building climate combined with exorbitant construction costs provide barriers of entry into this unique sought after market. The subject property offers an owner user or new investor the opportunity to buy into a high traffic commercial corridor at substantially below new construction costs. Located in South Berkeley in the highly sought after Adeline business corridor and just 1⁄2 mile south of the Ashby BART station. The subject property is in an outstanding location for both Cal Berkeley students, spill over San Francisco tech workers, and owner users. *The below disclosure links are considered confidential. By viewing or downloading any of these documents, user agrees to hold all information confidential. No sharing or reproducing of any kind is permitted. 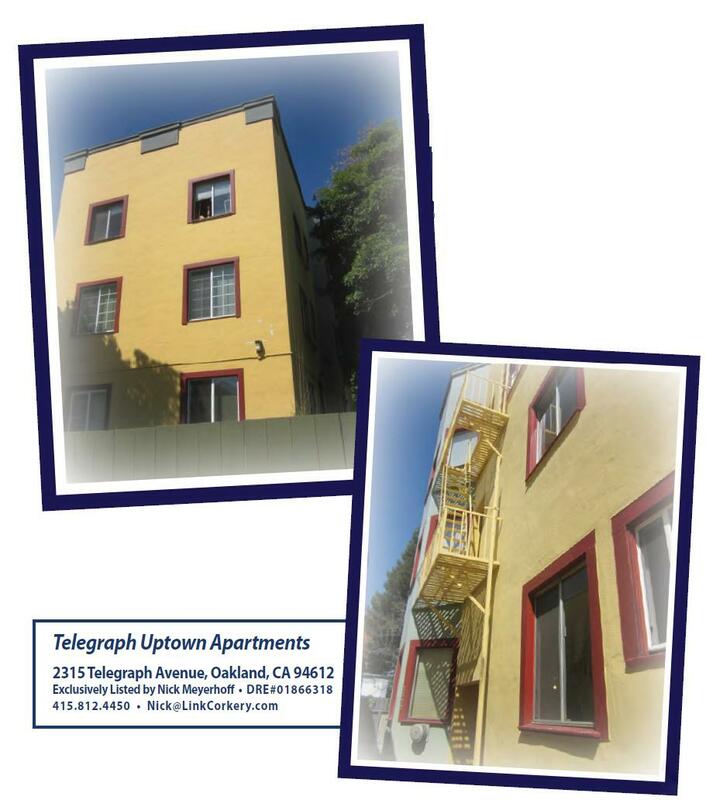 Telegraph Corner is a fantastic six-unit, mixed-use property situated in the Pill Hill neighborhood of Oakland, California. This gorgeous Victorian gem consists of two studios, two 1-bedroom units, a massive full-floor 2-bedroom penthouse, and a ground-floor commercial unit. All of the residential units but the penthouse have been remodeled with granite countertops and new appliances, designer tile, new fixtures, and refinished hardwood or pergo floors. Much of the interior has original period detailing, coved ceilings, and light-filled rooms. The stately Victorian structure sprawls across an oversized corner lot and is graced with original redwood siding shingles and a circular turret. There is gated parking for 5 cars as well as a private yard. The subject property offers a new owner the opportunity to buy into one of the hottest real estate markets worldwide in a rapidly globalizing city. For the past three years, Oakland has consistently ranked in the top 5 for appreciation and rent growth within the U.S.
Oakland is home to the Warriors, the Raiders, and the A’s, and is a port city with an international airport and an extremely diverse job force. There is a housing crisis that will continue to ensure high rent demand in this sub-market, particularly due to the proximity to BART. $100k Price Reduction. New cap rate 6%. 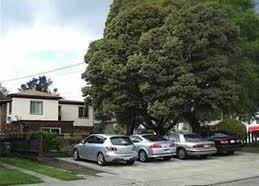 The BART Garden Apartments is a two-story, 8-unit apartment building for sale in Oakland California. This substantially renovated Garden-style building has undergone extensive renovation over the past two years, including new windows in all but one unit. Over the past year, the foundation has been engineered and seismically retrofitted, as well as the complete remodel of five units including in-unit washer/dryers and tankless hot water heaters. Please refer to the full list of capital improvements for more details. The subject property is centrally located in the inner San Francisco Bay Area just steps from Fruitvale Transit Village in Oakland California. Fruitvale Transit Village is a model showcase of retail, housing and public transportation. This property is directly in the path of progress. Office space on this same block has been leased by Google, and just 3 BART stops away Uber is opening its Oakland headquarters this year. Gentrification is occurring in every direction. The BART Garden Apartments are poised to appreciate into the foreseeable future, benefiting from continued technology spending and the San Francisco spill over. Oakland rent growth is outpacing nearly every other city in the U.S. 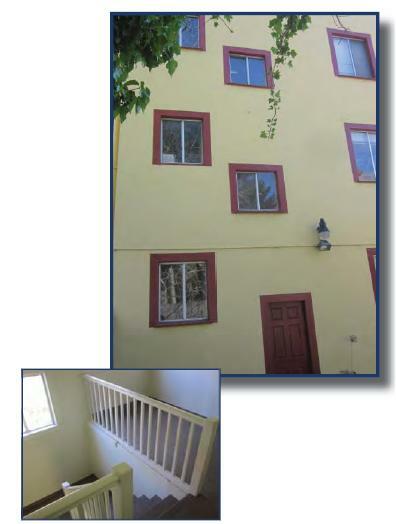 This fantastic small apartment building for sale in Oakland California has a 6% cap rate. The commercial real estate for sale in Fruitvale is in one of the hottest real estate markets worldwide in a rapidly globalizing port city. For the past three years, Oakland has consistently ranked in the top 5 for appreciation and rent growth within the U.S. Oakland is home to the Warriors the Raiders and the A’s, and is a port city with an extremely diverse job force and an international airport. There is a housing crisis that should continue to ensure high rent demand in this sub market, particularly due to proximity to BART. Current Oakland multi family market trend data indicates an increase of +12.9% in the median asking price per unit for compared to the prior 3 months, with an increase of +12.7% compared to last year’s prices. County-wide, asking prices for Multifamily properties are 7.3% higher at $219,993 per unit compared to the current median price of $198,570 per unit for Multifamily properties in Oakland, CA. From Loopnet. Mission Studios is a 1920’s era three story wood frame apartment building with a parapet façade and cement tile and redwood siding. It is master metered for gas and electric and has two unused large common areas on the second and third floors that was once used for laundry rooms. The property is fully detached on all sides with an oversized 35’ wide lot fronting 20th Street. The spacious back yard is split down the middle into two levels, a ground level concrete patio and a grassy higher level one flight up. Units number 1, 2 and 3 are accessed via breezeways on either side of the property and one is accessed directly from 20th street. 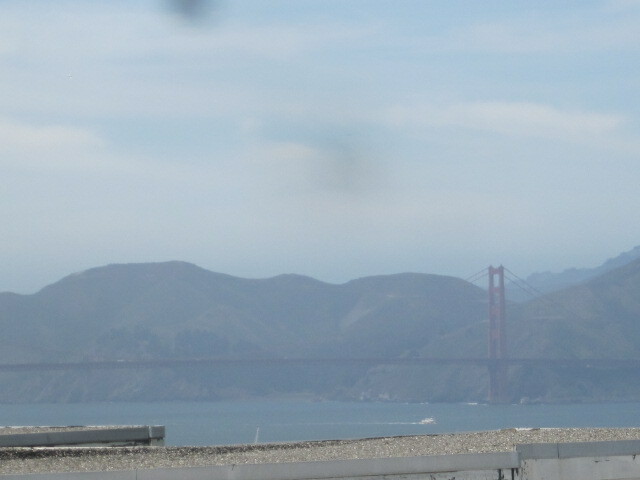 There is what appears to be an addition on the back of the building (visible via satellite photos) however there are no records indicating such changes. 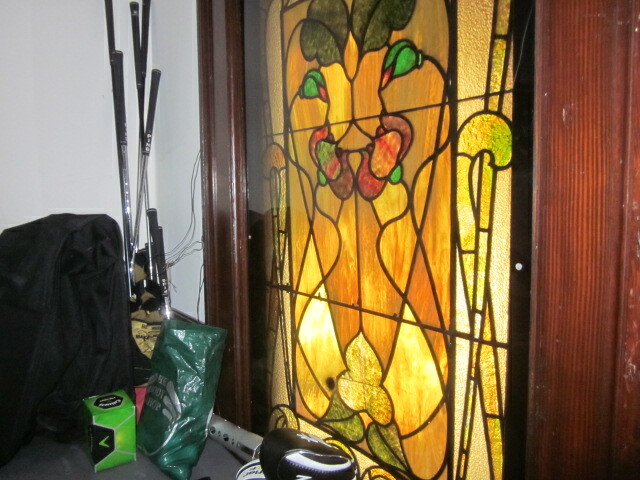 Many of the windows have been upgraded to vinyl high quality double hung units, primarily in the front of the building. There is one commercial water heater on the second floor and a combination of electric and gas stoves and heaters in the units. The subject property has an unusual layout with interior stairways that lead up the front then down the back to access the second floor. 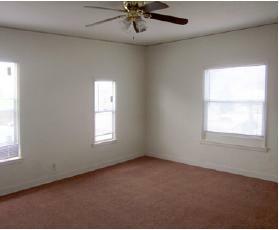 Many of the units appear to be studios converted to small one bedroom units and have more than one entrance with little or no living rooms. Each unit has its own bathroom and kitchen however there are two units that have a detached bathroom. Please note: There are some locked bedrooms and non conforming wall additions which appear to be sub-leased rooms without the owner’s permission. All units have significant deferred maintenance. The subject property offers a new owner the opportunity to buy into one of the hottest real estate markets worldwide. San Francisco is rapidly transforming into an internationally recognized market, on par with Hong Kong, London and Manhattan. Mission Studios is offered at substantially below construction and or replacement costs. Our research indicates there will be an extremely high demand for housing in this neighborhood for the foreseeable future, driven by the technology sector and a lack of new affordable housing. 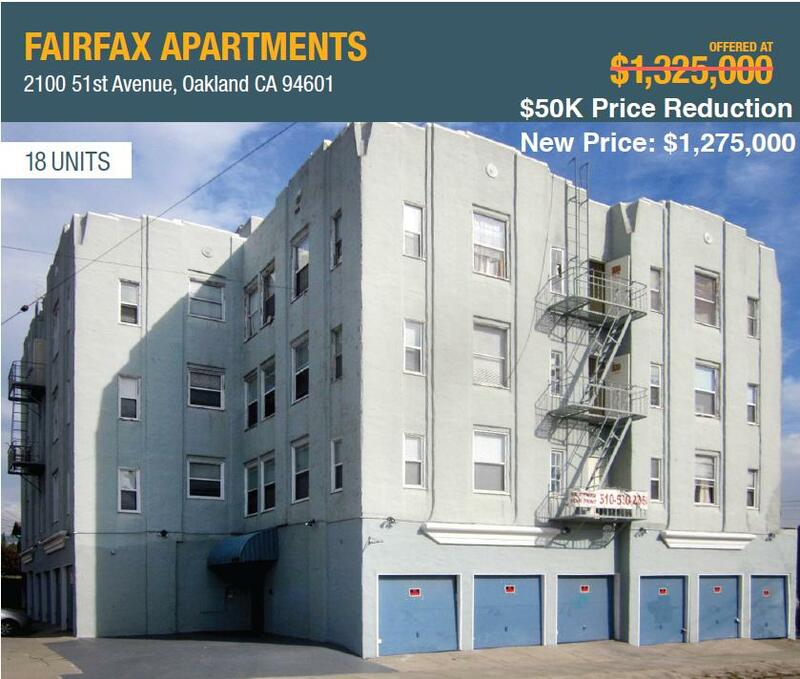 The Fairfax Apartments is located in Oakland California, recently voted a top 5 global travel destination by the New York Times and a top 10 city for rent growth by Fortune Magazine. The subject property is situated in the Fairfax neighborhood, between Frutivale and Maxwell Park and approximately 1.5 miles east of Fruitvale Bart. Oakland is in the midst of a paradigm shift fueled by the spill over effect from San Francisco where young affluent renters are being pushed over into the East Bay. Anchored by a five-year string of word class restaurants migrating into Oakland and stabilized by the emergence of a new high tech and micro food industry, Oakland is finally getting national recognition. Companies such as Pandora, Sungevity, Blue Bottle and Digital Realty are calling Oakland home and offering a diverse work force and an alternative to the congestion and over priced living in San Francisco. Fairfax Apartments is a stately, four-story, wood-frame, stucco building designed in a classic 1920’s Art Deco style. With unique architectural features such as a stair-stepped roof line and bold window framing, the building has a distinct San Francisco Marina appearance. Consisting of three studios and fifteen one bedrooms, The Fairfax Apartment encompasses an expansive 14,266sq ft and has an excellent unit mix. Each exceptionally large unit has an additional walk-in powder room with built in cabinets. A 1000sq.ft. vacant basement with 15’ ceilings is surrounded by 12 individual garages, some of which are separately leased. immediate area. Current rents are 20% or more below market and the stabilized tenant base enjoy extremely large units that may be able to be converted from 1 bedroom to 2 bedroom units. The current owner has conducted numerous repairs over the years including the renovation of 14 of the units, replacement of 60% of the windows, and a completely rebuilt boiler system. The roof is sloped tar and gravel and may need replacing within the next 5 years. The offering affords the new owner an opportunity to acquire a stabilized Bay Area multi-family asset at under $100/sq.ft. with an attractive initial yield, and with substantial remaining upside. 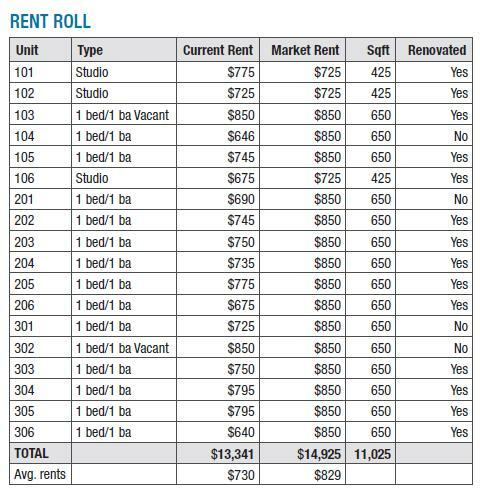 All this in a rapidly appreciating rental market with a 3.1% vacancy rate according to ReisReports. Significant upside in rents, same owner for over 20 years.All tenants are paying on time, not a distressed sale. Some deferred maintenance but many units have been renovated. Neighborhood is stable and there are 12 garages and a huge undeveloped basement. The Bridge Street Apartments is a bread and butter, wood frame and stucco, seven unit apartment building. It has high-quality tenants and has been professionally managed. The current owner has spent over 100k in capital improvements over the past three years renovating each unit and painting the exterior. The subject property has garage parking for four cars, is very low maintenance and has some upside in rents. Bridge street is one of the quietest tree lined streets in Fruitvale and is walking distance to BART. This property is located on a corner lot. Additional capital improvements include new tile and flooring, new light fixtures, remodeled bathrooms, and much more! The property is located in Oakland’s Fruitvale neighborhood, two miles south of Lake Merritt and walking distance to Fruitvale Bart, AC Rapid Transit, shopping centers, and dining. Recently, Fruitvale has been experiencing rapid renovation. In 2004, the Unity Council opened the Fruitvale Transit Village. The “Fruitvale Village” has become a model of transit oriented development, showcasing a mixture of retail and housing integrated with public transportation. The Leavenworth Triplex is an elegant Nob Hill apartment building with original hardwood floors, period detailing and stained glass. Constructed in the early 1900’s this stately property boasts expansive four bedroom top and mid floor units and a three bedroom lower unit. The subject property has been in the same family for nearly 50 years and has maintained its original charm and character while undergoing significant upgrades such as new electric service, copper re-piping, central heating in some units, re-glazed windows and a newer roof. The top and bottom floors are tenant occupied and the middle floor is occupied by one of the owners who is a protected tenant. The Leavenworth Triplex is located in San Francisco’s Nob Hill, one of the most spectacular neighborhoods in the city. With cable car lines, elite homes and luxury hotels such as Mark Hopkins and the Fairmont, Nob Hill remains a destination for tourists and wealthy residents. The Leavenworth Triplex is bordered by Polk Street on the West and Chinatown on the East. It’s a quick walk downhill to the financial district making it an ideal residence for working professionals. This stately gem is literally in the center of everything in San Francisco. Telegraph Uptown Apartments is a uniquely styled 9 unit building built in 1944. It features 3 1bedroom 1bath units and 6 studios with a fully gated lot and laundry room. Located in Uptown in the epicenter of a thriving new cultural center, this brightly painted yellow icon offers tenants access to numerous restaurants and bars along the Broadway/Telegraph corridor. With a bustling night life and fantastic restaurants, this building has histori­cally low vacancy and stands to benefit from the increasing rents driven by local high tech firms in Oakland and San Francisco. The subject property is in close proximity to 19th St. BART, Paramount Theater and Downtown Oakland City Center. Easy access to 980 FWY and San Francisco. Centrally located in Oakland’s Adams Point district, this 44-unit building is just a block from Lake Merritt and close to downtown Oakland, BART and shopping, including the Whole Foods grocery and Grand Avenue. A spacious tile entrance and lobby open onto a courtyard featuring a sparkling swimming pool. Fifteen apartments overlook the pool and fourteen apartments in the rear of the property have balconies overlooking downtown Oakland and San Francisco. Strong on-site management keeps the property looking pristine at all times. The unit mix is 40 one-bedroom units, a 3-bedroomunit, two 2-bedroom units and a studio for a total of 44 units. Units are very well laid out and most have a large walk-in linen closet/pantry. Within the last seven years, the property has undergone extensive renovation, including balconies, Art Deco façade, pool and pool deck, pool equipment, some windows, several kitchens and bathrooms, walkways, hot water holding tanks, laundry rooms and more. Gross square footage: 27,629 square feet per cty. Lot Size: 13,313 square feet per cty. 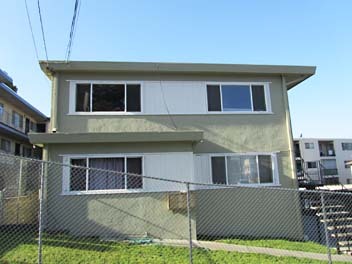 This attractive 6-unit building is located in the popular Fruitvale District of Oakland. Each unit is 2 bedrooms, 1 bath with over 800 square feet. The apartments are spacious and well- designed with most having been upgraded. Floors are carpet and vinyl and the building is freshly painted. 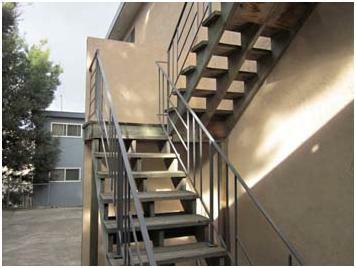 The apartments are conveniently located 1 block off of Fruitvale Avenue and close to 580 and 880. Public transportation and shopping are within walking distance. Schools, parks and entertainment facilities are also within walking distance from the property. The neighborhood predominantly consists of single-family dwellings. The Fruitvale District is going through a rebirth. This is an excellent opportunity to be part of a growing, vibrant area. Gross square footage:4962 sq. ft.
at 3.75% / 30 year adjustable. 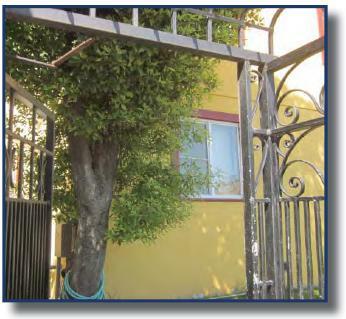 The Prentiss Apartments is an attractive five-unit building is located in the popular Fruitvale District of Oakland. Four of the units are 2 bedrooms 1 bath, with over 900 square feet, and the fifth unit is 3 bedrooms 2 baths, with over 1,000 square feet. All units have front and rear entries, and the rear entries are to patios and decks. The floors are hardwood, carpet and vinyl and the building has a brand new roof. The Prentiss Apartments are spacious, well-designed and 100% occupied. 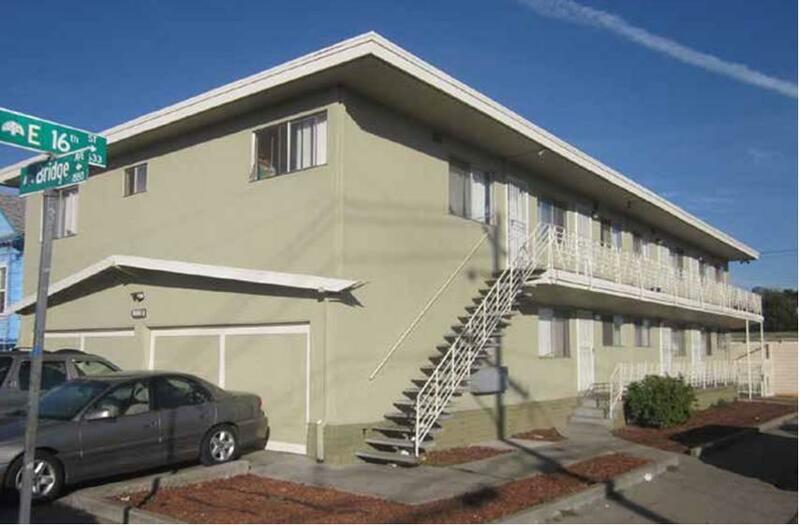 The apartments are conveniently located 1 block off Fruitvale Avenue and close to 580 and 880. There is public transportation and shopping within walking distance. Public transportation and shopping are within walking distance. The Fruitvale District is going through a rebirth. This is an excellent opportunity to be part of a growing, vibrant area. 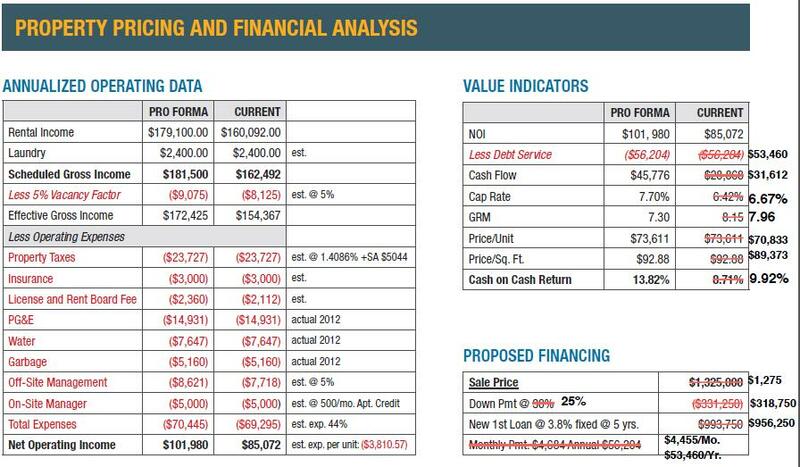 Proposed Financing: New 1st loan at 65% LTV in the amount of $389,350 at 4.25% fixed for 5 years amortized over 30 years. I have a list of the top 10 properties, call or email me if you would like to have it. Attractive 4­plex in North Oakland near Children’s Hospital. Three apartments on the ground floor and a large two ­bedroom apartment on the entire second floor occupied by a younger long term tenant at low rent , but ideal for an owner occupant . Offers off- ­street parking and nice landscaping. High Street Apartments was built in 1989 and is therefore exempt from rent control. It features a gated parking garage, numerous balconies surrounded by mature trees and laundry facilities. Nearly all the units are two-bedroom with desirable ﬂoor plans. This interesting building is interconnected by exterior catwalks and corridors providing wide balconies, many of which have views of the Oakland Hills or San Francisco Bay. An historically low vacancy rate is testament to the desirability of this building. With moderate aesthetic work this property can be transformed into a true cash-flowing gem. 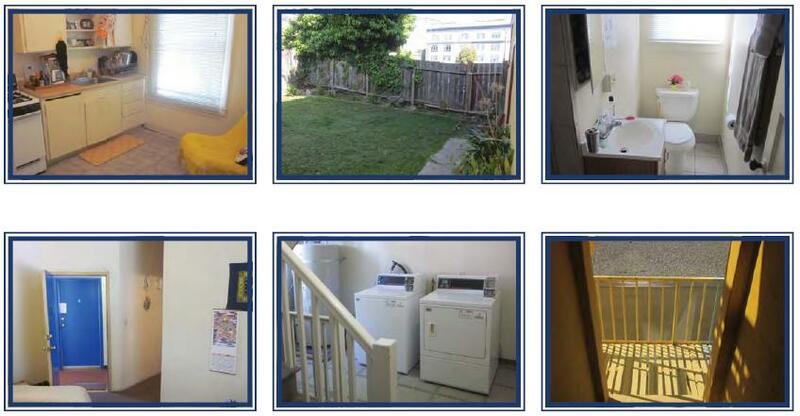 This property is in close proximity to three parks, an elementary school, the 580 Fwy and not far from the Fruitvale BART station and Oakland’s Mills College. The High Street Apartments provides outstanding cash ﬂow of over $6000/mo in cell site income. The current owner has been offered $400,000 cash to sell the income from these sites. There is a possibility of adding more sites at this location, providing a new owner with upside in cash ﬂow. The Kerwood Apartments is a very well located, professionally owned and operated, 32-unit apartment building comprised of 9 2-bedroom units, 21 1-bedroom units, and a pair of penthouse suites with 180 degree views. This distinctive 3 story building is a landmark of High Street. Situated in the epicenter of a culturally thriving community and the newly established Mi Pueblo Food Center, The Kerwood is within 1 mile of the Fruitvale BART station and in close proximity to Mills College. Laundry on each floor, a high quality over sized elevator and ample secure underground parking round out the highest quality apartment on High Street. Gross square footage: 27,377 sqft. Util. paid by owner: Cold and hot water, common lights, common gas, garbage. Floors: Carpets, tile and lino. The Kerwood has the right balance of convenience, location and style. The lobby has a beamed ceiling and the building is encompassed by high quality iron gates providing tenants with a real sense of privacy and security. Underground parking consists of 28 spaces with 4 additional covered spaces outside. 1800-1812 57th Avenue, Oakland, CAThis urban oasis consists of 26 condominiums currently being rented as apartments. The seller, which acquired the property through foreclosure in December 2008, owns 25 of 26 condominiums and intends to convey all 26 at close of escrow. Pueblo Alegre is a gated community consisting of two 4-plexes built in 1986 containing three bedroom/two bath units, and 18 studio and one-bedroom Spanish-style cottages built in 1929, with parking for all units in the rear.